The long awaited word came yesterday, when NYS Governor Andrew Cuomo made it official. 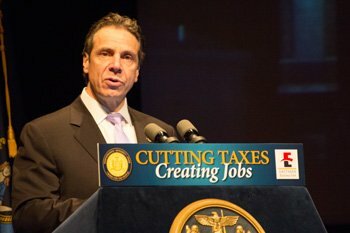 During a community meeting on the campus of Eastman Business Park, Cuomo announced that the State will commit $3 million to the EBP Bioscience Manufacturing Center in Rochester which will begin construction later this year. The construction of the $25 million, 60,000 square feet facility, which will improve equipment for converting non-food plant materials into biofuels and biochemicals, will create hundreds of new jobs. The center is a top priority of the Finger Lakes Regional Economic Development Council. The project will consist of transportation infrastructure improvements and the production, fermentation tanks and storage equipment necessary to convert feedstock into C5 and C6 sugars. These sugars can then be employed in the manufacture of a wide range of green chemicals, biodegradable plastics, and biofuels. Once operational, the center will be capable of processing up to 30,000 tons of sugars annually. In addition, the partnership between New York State and the EBP Bioscience Manufacturing Center builds upon the state's ongoing effort to pursue and improve access to renewable energy. Brad Kruchten, President of Kodak Graphics, Entertainment and Commercial Films, said all the “physical pieces now exist, but more importantly, all the technical talent needed is also present at EBP" for the center. He added that the Park's fermentation tanks, sterilization tanks, pumps, separation equipment, seed tanks, product storage and air compressors “will allow upstream sugar suppliers to convert their materials into high value products such as biochemical and bioplastics." The site also has access to three bio-refineries, specialty chemicals pilot and manufacturing capabilities – as well as waste water treatment facilities, water and rail access, Kruchten said.